Kos is a favourite holiday destination for families. 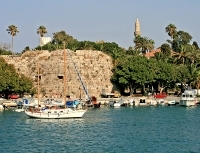 Its highlights include beautiful beaches, enchanting ruins and quick ferry crossings to Rhodes or Bodrum (Turkey). In antiquity, Kos may have had some claim to being a healing retreat. The famous Classical Age physician, Hippocrates, reputedly taught his students on the island, and visitors can still see the remains of temples dedicated to healing deities. Kos is also home to what some claim is Europe's oldest tree, plus several archaeological remains of Persian, Turkish, Roman and Byzantine conquerors. Otherwise, visitors can expect busy bars, pleasant towns and crowded beaches outside the capital.